Heavy duty design to carry combinations of cylinder sizes - minimum cylinder height 1000mm. 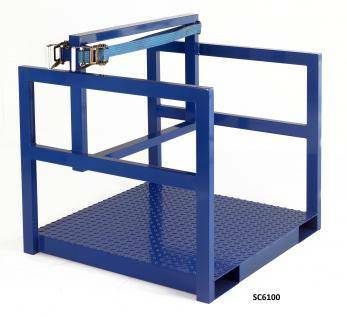 Manufactured from strong box section supports, thick sheet steel fork pockets and checker plate base. Cylinders secured with rachet straps mounted to internal framework. Overall dimensions H x W x D: 1000 x 1020 x 1000mm. Fork pocket dimensions H x W: 70 x 195mm. Deck sizes internal (W x D): Front 940 x 670mm. Rear 940 x 270mm.